Is the U.S. about to engage in a trade war? Markets are down as political rhetoric continues to escalate around everything from tariffs to trade deficits. With so much attention being paid to international trade, we thought now would be a great time to figure out which states’ economies depend the most on imports and exports. We crunched the numbers and created a new graph. We gathered our data from a few different places. The Bureau of Economic Analysis keeps track of GDP figures at the state level, the US Census Bureau tabulates trade figures for each state, and the American Enterprise Institute neatly synthesized the information. Last year we graphed data in an intuitive map of the U.S., but we decided to change things up this time around with a circular bar chart. Each blue bar represents the total GDP ($B) for each state. 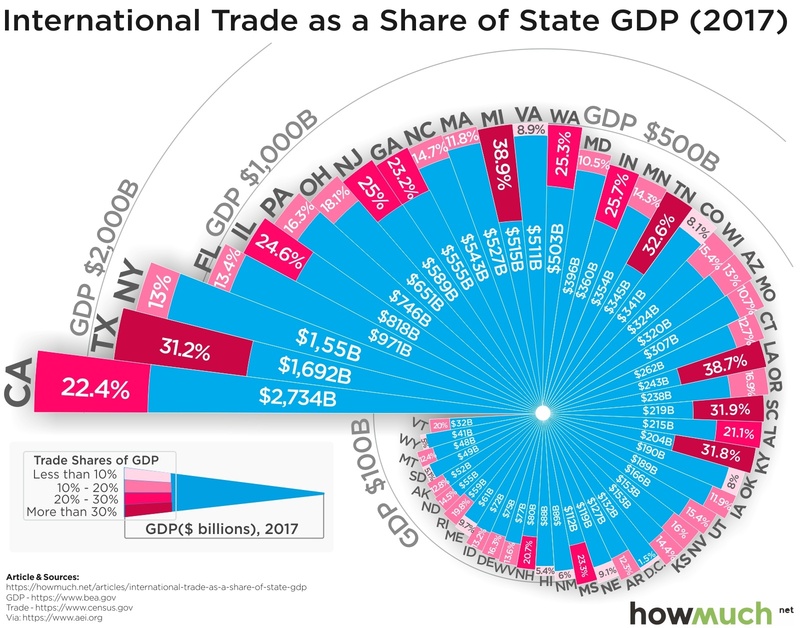 Because states vary significantly in size, we added a color-coded red bar to represent the percentage of the state’s economy dependent on trade. In other words, this metric tells you how important trade is to the overall economy of both large and small states. We can quickly learn a lot about the American economy by looking at this kind of data. The average state generates about 20% of its economic activity through international trade of one kind or another. Six states get more than 30% of their GDP this way. Three states with huge economies are extremely reliant on trade: California ($2,734B total GDP with 22.4% from trade), Texas ($1,692B total with 31.2% from trade), and New York ($1,550B total with 13% from trade). Pause for a moment and think about that. California alone depends on trade for more than $600B of their GDP every year. That’s bigger than the entire GDP of the 11 smallest states in the Union! Given President Trump’s rhetoric around trade deficits and tariffs, we might expect him to perform better in states with a low dependence on foreign trade. Surprisingly, however, the exact opposite is true. He won seven of the top ten states most reliant on foreign trade, including each of the top five, and lost six of the ten states least dependent on foreign trade (including Washington, DC). Elections clearly aren’t won or lost based on economic interests alone. We know several states that voted for President Trump directly benefit from high levels of international trade and pundits are learning to pay more attention to Trump’s actions as President than simply basing their analyses on what he says, on Twitter or otherwise. The recent carve-outs for American allies on his steel tariffs are only the latest case in point. We will have to wait and see if his recent trade war rhetoric follows a similar pattern.